Resize and convert images into different formats fast and easy to use freeware. With Image Resizer you'll be able to send photos via email, move them from one folder to another and free space on your hard drive. This program will convert any image into many formats, even Ipod photo and video, Sony PSP, HDTV and DVD. The reduced file size enables faster loading, better management of the pictures and saves space. ...... Work on individual photos or edit large numbers of images by doing a batch resize in just one click. Add your own watermark to protect your work or add a copyright to photos with html-like text formatting and transparency support. Customize pictures by converting them to sepia or add a border. Use the live preview to see what the final result will look like before actually processing the image. Image Resizer works on files, folders and subfolders, and supports RAW formats. With multi-core support integrated, convert images even faster. Launch the application easily from Windows shell explorer with a right click on the image or folder. 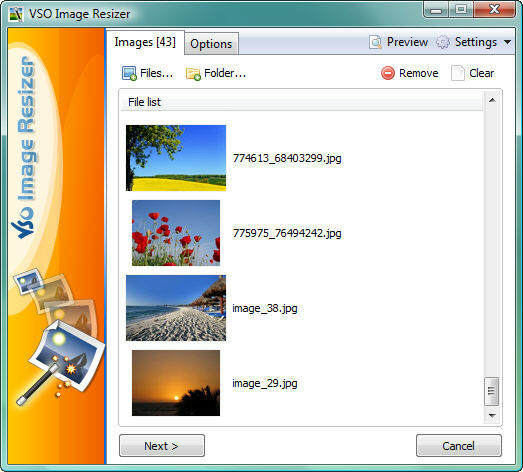 Qweas is providing links to Image Resizer by VSO 4.0.2.5 as a courtesy, and makes no representations regarding Image Resizer by VSO or any other applications or any information related thereto. Any questions, complaints or claims regarding this application Image Resizer by VSO 4.0.2.5 must be directed to the appropriate software vendor. You may click the publisher link of Image Resizer by VSO on the top of this page to get more details about the vendor.